NEW YORK – Sound designer Darron L. West has selected d&b audiotechnik’s Soundscape technology for the theatrical revival of Lobby Hero. An intense and intimate study into the human condition, or the latest staging of a sharp piece of drama from the 2017 Oscar-winning writer of “Manchester by the Sea,” Kenneth Lonergan: both descriptions are easily accepted for the revival of Lobby Hero on Broadway. This masterful presentation by Second Stage Theater at the Helen Hayes Theater, with the dramatic action all taking place within the lobby of an apartment building, clearly demonstrates Lonergan’s particular skill and sensitivity for realistic everyday dialogue. Such plausibility is equally revealed in the mechanics of the presentation; David Rockwell’s set design based upon a revolve constantly pulls and pushes the audience through very personal and revealing episodic exchanges. Ensuring that everyone gets to fully apprehend the nuance of such exchanges has led sound designer Darron L. West to explore an equally intimate and revealing new piece of technology from d&b audiotechnik; d&b Soundscape. The big question is what prompted West to be the first sound designer on Broadway to try this technology? d&b Soundscape is a signal processing engine and matrix – the DS100 – with two optional software modules. 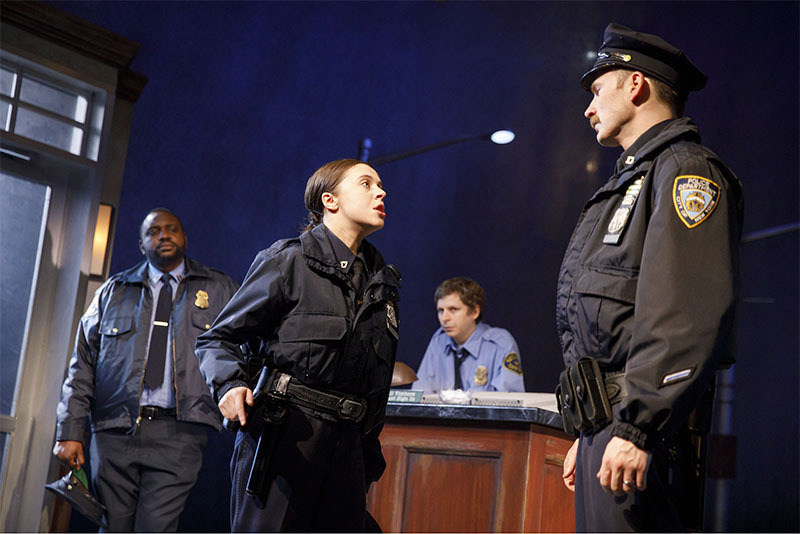 For the purposes of Lobby Hero, the En-Scene software option was used to allow West the individual placement and movement of up to 64 sound objects – in this case the familiar noisy environment of a New York street adjacent the lobby. The deployment of d&b loudspeakers was not so different from how a sound designer might normally address a traditional theater space with proscenium L/R at the upper and lower levels, center cluster and down-fill, under and over-balcony delays, and a surround system across the orchestra and balcony levels, plus subs. The difference is in how Soundscape can affect the delivery, as West and Coes describe. West saw the delivery from d&b Soundscape in very precise terms. “For me the one thing I did not want was for Soundscape to take a lot of notice. It had to be something integral to the production, not imposed on top of the play. That it has achieved, Lobby Hero remains a show of subtleties.” Coes agreed, “Lobby Hero isn’t a show that is all about sound or design generally. Trip Cullman, our director, has kept us all focused on the phenomenal acting from every member of our cast. The world exists around them and in transitions around the audience as well, pulling us in.